The good news is that a Greek default, which has become more likely after Prime Minister Alexis Tsipras’ provocative rejection of what he described as the “absurd” bailout offer by Greece’s creditors, no longer poses a serious threat to the rest of Europe. The bad news is that Tsipras does not seem to understand this. To judge by Tsipras’s belligerence, he firmly believes that Europe needs Greece as desperately as Greece needs Europe. This is the true “absurdity” in the present negotiations, and Tsipras’ misapprehension of his bargaining power now risks catastrophe for his country, humiliation for his Syriza party, or both. The most likely outcome is that Tsipras will eat his words and submit to the conditions set by the “troika” (the European Commission, European Central Bank, and the International Monetary Fund) before the end of June. If not, the ECB will stop supporting the Greek banking system, and the government will run out of money to service foreign debts and, more dramatically, to pay Greek citizens their pensions and wages. Cut off from all external finance, Greece will become an economic pariah – the Argentina of Europe – and public pressure will presumably oust Syriza from power. This outcome is all the more tragic, given that the economic analysis underlying Syriza’s demand for an easing of austerity was broadly right. Instead of seeking a face-saving compromise on softening the troika program, Tsipras wasted six months on symbolic battles over economically irrelevant issues such as labor laws, privatizations, even the name of the troika. This provocative behavior lost Greece all potential allies in France and Italy. Worse still, the time wasted on political grandstanding destroyed the primary budget surplus, which was Tsipras’s trump card in the early negotiations. Now Tsipras thinks he holds another trump card: Europe’s fear of a Greek default. But this is a delusion promoted by his finance minister, Yanis Varoufakis. A professor of game theory, Varoufakis recently boasted to the New York Times that “little Greece, in order to survive, [could] bring down the financial world,” and that his media image “as an irrational fool… is doing my work for me” by frightening other EU finance ministers. Apparently, Varoufakis believes that his “sophisticated grasp of game theory” gives Greece a crucial advantage in “the complicated dynamics” of the negotiations. In fact, the game being played out in Europe is less like chess than like tic-tac-toe, where a draw is the normal outcome, but a wrong move means certain defeat. The rules of this game are much simpler than Varoufakis expected because of a momentous event that occurred in the same week as the Greek election. On January 22, the ECB took decisive action to protect the eurozone from a possible Greek default. By announcing a huge program of bond purchases, much bigger relative to the eurozone bond market than the quantitative easing implemented in the United States, Britain, or Japan, ECB President Mario Draghi erected the impenetrable firewall that had long been needed to protect the monetary Union from a Lehman-style financial meltdown. The ECB’s newfound ability to print money, essentially without limit, to support both banks and governments has reduced Greek contagion to insignificance. That represents a profound change in Europe’s financial environment, which Greek politicians, along with many economic analysts, still fail to understand. Before the ECB’s decision, contagion from Greece was a genuine threat. If the Greek government defaulted or tried to abandon the euro, Greece’s banks would collapse, and Greeks who failed to get their money out of the country would lose their savings, as occurred in Cyprus in 2013. When savers in other indebted euro countries such as Portugal and Spain observed this, they would fear similar losses and move their money to banks in Germany or Austria, as well as sell their holdings of Portuguese or Spanish government bonds. As a result, the debtor countries’ bond prices would collapse, interest rates would soar, and banks would be threatened with collapse. If the contagion from Greece intensified, the next-weakest country, probably Portugal, would find itself unable to support its banking system or pay its debts. In extremis, it would abandon the euro, following the Greek example. Before January, this sequence of events was quite likely, but the ECB’s bond-buying program put a firebreak at each point of the contagion process. If holders of Portuguese bonds are alarmed by a future Greek default, the ECB will simply increase its bond buying; with no limit to its buying power, it will easily overwhelm any selling pressure. If savers in Portuguese banks start moving their money to Germany, the ECB will recycle these euros back to Portugal through interbank deposits. Again, there is no limit to how much money the ECB can recycle, provided Portuguese banks remain solvent – which they will, so long as the ECB continues to buy Portuguese government bonds. In short, the ECB bond-buying program has transformed the ECB from a passive observer of the euro crisis, paralyzed by the outdated legalistic constraints of the Maastricht Treaty, into a proper lender of last resort. With powers to monetize government debts similar to those exercised by the US Federal Reserve, the Bank of Japan, and the Bank of England, the ECB can now guarantee the eurozone against financial contagion. Unfortunately for Greece, this has been lost on the Tsipras government. Greek politicians who still see the threat of financial contagion as their trump card should note the coincidence of the Greek election and the ECB’s bond-buying program and draw the obvious conclusion. The ECB’s new policy was designed to protect the euro from the consequences of a Greek exit or default. The latest Greek negotiating strategy is to demand a ransom to desist threatening suicide. Such blackmail might work for a suicide bomber. But Greece is just holding a gun to its own head – and Europe does not need to care very much if it pulls the trigger. Anatole Kaletsky's comment can be summarized as follows: the ECB will save the Eurozone from any contagion from Grexit, which increasingly looks like a done deal. Unfortunately, he fails to understand what contagion is and the consequences of a Greek default to the global financial system. If Greece defaults, all hell will break loose, ushering in an era of global deflation. The ECB and the Fed know this. Far from ringfencing Greece, the ECB is aiding and abating Tsipras and Varoufakis's stalling strategy through its ELA program. Having said this, if Greece doesn't reform its grossly over-bloated and inefficient public sector, cut pensions and reform its labor market, then it will suffer a slow and painful death. I'm actually amazed at how ignorant Kaletsky is on the "ECB's newfound ability to print money" and more importantly, the consequences of Greek default for the global financial system and economy. Some have put forth strong arguments as to why Germany is bluffing on Greece, but these seem to escape Kaletsky's simplistic and vitriolic diatribe (reminds me of the idiotic op-ed from Roger Cohen the New York Times published, The Greek Trap). Kaletsky is a long-only equity manager moonlighting as a financial commentator; do not be surprised. I stand by my "summer of malaise" analysis emailed a couple weeks ago now. You are right, the next pressure tactic is a curtailment of ELA by ECB. This will be followed immediately by capital controls. With European assets heavily pressured by markets (as we have begun to see today), proper discussions can be had by both sides. In his latest comment on Project Syndicate, Europe's Last Act?, Joe Stiglitz warns that this 'game of brinkmanship' with the Greek government, asking them to sign on to increasingly unacceptable terms (like jacking up taxes when the country is in a debt deflation spiral!! ), is insane and it won't end well for all parties. People who underestimate the risks of contagion from a Grexit scenario are living in Fantasyland. I guarantee you that central banks around the world, including the Fed, are looking very closely at geopolitical developments in Greece and elsewhere. As I've stated many times in this blog, this time is really different and if the Fed ignores international developments and starts raising rates too soon, it will be making a monumental mistake, igniting a liquidity time bomb and a crash unlike anything we've ever experienced before. All this to say that too many market participants glued on their Bloomberg terminal need to take a step back and think more carefully about the world and the real risks that lie ahead. In that comment, I also embedded a CNBC clip where Jeffrey Gundlach, Doubleline Capital CEO and the new bond king, openly mocked the ECB's power to save the eurozone from the ongoing deflation crisis. It's still going on, and even though there is a temporary reprieve, I certainly don't believe the deflation trade is dead (far from it; more on that next week). But some of the demands of creditors are bordering on the ludicrous, like hiking the value added tax to 11% for drugs (6.5% currently) and 23% for electricity (13% currently) and scrapping the welfare benefit for the very low-income pensioners and disabled people (EKAS). In fact, when you look at some of the proposals creditors put forth, you have to wonder whether they are truly interested in saving Greece or just letting it sink further into a debt deflation hellhole. For its part, the left-wing Greek government is equally absurd in its intransigence, refusing to reform Greece's over-bloated and inefficient public sector, its inflexible labor market, and a pension system which is already past the breaking point. Greek officials had been hesitant to compromise over its pension programs, as it had already run into problems paying retirees earlier this year. But with little time remaining to avoid a default, the supposed "sticking point" might be the breakthrough that brings the two sides together. If the newest proposal even slightly compromises on pensions, it could be a major factor. Greece spends more than any other European country on pensions as a percentage of GDP, around 17 percent. That's 5 percent above the European average, and it was projected to swell to nearly a quarter of the country's GDP by 2060. An aging population has made things worse, but it's not a unique problem for a country to have. What is unique, however, is that three-fourths of Greek pensioners are filing for early retirement benefits—allowing workers to retire before age 61. While Germany recently lowered its retirement age to 63, U.S. workers generally have to be 67 years old before reaping similar benefits, yet even when they do. American benefits pale in comparison. Even after factoring in cuts called for by creditors in 2010, pensioners in Greece still boast net pension benefits at a multiple of 8.4 times annual gross earnings, compared with just 6.7 for those in Germany, and 5.6 for retirees in the United States. Generous benefits like that catch the attention of European creditors such as German Chancellor Angela Merkel, who made tough cuts to her own budget when the recession hit. "How do you tell your citizens to retire at 63 when the guys you are writing a check to retire at 61?" posits Edward Dempsey, chief investment officer at Pension Partners. "That's a hard sell that her opponents would absolutely use against her." Greece officials tried to deflect a change in attitude over pension reform saying, the country has been flexible for a long time on pension reform, willing to scrap incentives for early retirement and proceed with merging pension funds. But creditors like the IMF hadn't been pleased with what they had seen before Greece's latest proposal on Tuesday. The newest proposal from Greek Prime Minister Alexis Tsipras already has creditors feeling optimistic. The European Union's economics commissioner, Pierre Moscovici, said talks were making progress, citing the new Greek proposals on early retirement and merging pension funds. The country's central bank governor, Yannis Stournaras, has urged outsiders to respect the sacrifices Greeks have made to stick with the euro, pointing to a 35 percent fall in living standards since the global downturn began in 2009. Older citizens reliant on Greek pensions have already felt the effects of the credit crunch. Earlier this month, more than 2 million pensioners suffered through delayed payments after the government claimed a "technical glitch" held up disbursements, according to the Financial Times. But officials cited by the paper said state pension fund shortfalls were the real reason behind the delay. "There can be a deal on reforms—without it necessarily needing to include harsh cut backs on pensions or mass layoffs of workers, which are recession-creating measures," one Greek official told CNBC last month. To find out why Greece’s pension system is tying negotiators up in knots, look no further than Maria Kounani, 59, a mother of two, single parent and early retiree. The maker of sewing patterns applied for a reduced pension last year, when the business where she’d worked for 20 years struggled with unpaid orders. To qualify for a full pension she needed to work another 10 years. She opted for early retirement, the only real choice she says she had, and one Greece’s creditors say is undermining the pension system. As Greek pensions remain a key sticking point in talks with creditors, cases like Kounani show why there are no simple ways out. For creditors, the pension system is still too generous. For the Greek government, it’s a system struggling to cope after five years of recession and dwindling contributions in a nation with the European Union’s highest unemployment. In the first quarter, the rate was 26.6 percent overall and 30.6 percent for women. An aging population and an 8 billion-euro ($9 billion) hit to pension finances because of the largest sovereign debt restructuring in history in 2012 hasn’t helped. Creditors are asking Tsipras to implement reforms agreed to and deliver savings of as much as 0.5 percent of gross domestic product this year and 1 percent next year in part by immediately clamping down on early retirees. They also want supplementary pension funds -- lowered about 5 percent last year -- to be financed by contributions, not the state budget. Greece’s creditors are leaning on the prime minister to deliver a package of economic reforms and budget fixes to get the country’s finances on track. Tsipras has until the end of the month to release a payment of as much as 7.2 billion euros from the country’s rescue package before the agreement expires. In parliament on June 5, Tsipras called the proposals from creditors “unrealistic” and said no lawmaker could agree to demands such as removing a stipend from the lowest-paid pensioners. Tsipras has agreed to merge funds to cut costs and close loopholes that allow early retirement. He blamed five years of austerity for weakening the system, saying fund reserves fell by 25 billion euros through the 2012 debt swap and high unemployment. In the last five years, pensions fell as much as 48 percent, Tsipras said, while 45 percent of recipients get pensions that are below the poverty threshold. Kounani gets a provisional payment of 420 euros a month and will get a final pension disclosed to her next year. She hopes it will be a little more than what she gets now, so that there’s a bit left over after paying her rent of 360 euros a month. In 2012, Greece spent more relative to GDP on pensions than any other EU nation. The 17.5 percent of GDP it spent compared with the EU average of 13.2 percent, according to the most recent Eurostat figures. That’s in part because the Greek economy has shrunk by a quarter since 2008. An aging population isn’t helping -- Eurostat predicts Greece will have one of the highest dependency ratios in the EU, with fewer than two working adults per dependent by 2060. The wave of reforms begun in 2010, in the months after Greece agreed the terms of its first bailout with the European Commission, International Monetary Fund and European Central Bank, scaled back payments, introduced means-testing, raised the statutory retirement age and calculated pensions over the entire working career. The result was Greece was able to move from having the weakest pension system in the world in 2011, according to Allianz Asset Management’s pension sustainability index, to cede that place to Thailand, Brazil and Japan in 2014. Greece chased employers and employees to pay contributions. Bank of Greece Governor Yannis Stournaras said on June 2 that public pension expenditure is set to decline by about 1.9 percent of GDP by 2060, the fifth best performance in the EU, citing the European Commission’s 2015 Aging Report. Still, the recession, with rising unemployment and a wave of company closures, has hit contributions. Greece’s debt restructuring cut the nominal value of the bonds held by pension funds by 8.3 billion euros, Simeonides estimates. The funds may take further real hits when they’re forced to sell their holdings to pay pensioners, he said. For her part, Kounani says she didn’t want to lean on the pension system. The tragedy in all this is that there are many relatively young adults like Maria Kounani who would like to continue working but can't because jobs are scarce for older workers. 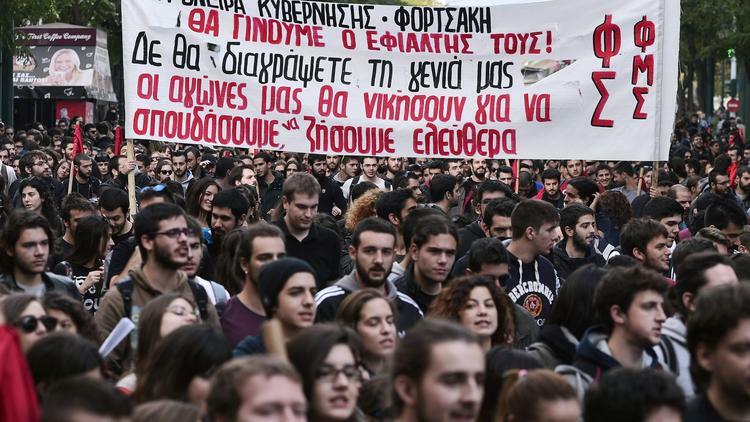 It's even worse for younger Greeks struggling with a crippling unemployment rate above 50%. In a world of chronic underinvestment, policymakers around the world are grappling to spur growth but seem incapable of addressing rising inequality and soaring long-term unemployment. Nowhere is this more evident than in Greece which desperately needs foreign investment to help it grow its way out of this depression. Apparently, Greece is close to an agreement with its foreign lenders. A deal will most probably include a commitment to budgetary surpluses that will gradually increase. A commitment is crucial because it suggests the intention to honor our obligations. It would also convey a message that we no longer wish to live on borrowed money. Achieving a small budgetary surplus of about 1 percent of GDP in 2015 would mean introducing 4 billion euros’ worth measures or more. The figure will grow with each day that passes without an agreement. It would be ideal if that 4 billion could come from a decrease in state spending. A serious reduction would be a far cry from moves such as rehiring staff at state broadcaster ERT. Strangely, government officials appear unable to grasp the fact that a budgetary surplus can only be achieved by raising revenues or cutting down on waste. All we hear is talk of increasing taxes. Not a single word about reducing spending. The leftist-led government has ruled out recessionary measures. In Finance Minister Yanis Varoufakis’s Orwellian speak, tax hikes are not a recessionary measure. Should spending be contained by trimming salaries in the state sector or by reducing the number of staff? Over the past few years spending cuts have been based on reducing wages and pensions. No one would like to see them reduced further. Cutting wages too much discourages civil servants and creates counterincentives. It undermines the quality of services and breeds corruption. The only alternative policy is the one that has never been tried, and that is to reduce spending by abolishing the dozens of unnecessary agencies and departments, and making their staff redundant. In a recent article in Estia newspaper, lawyer and former Justice Minister Giorgos Stefanakis reminded readers of something late Socialist Prime Minister Andreas Papandreou wrote in To Vima newspaper on October 25, 1987: “We have twice as many civil servants as we need to carry out the necessary public services.” After the 2004-09 Costas Karamanlis administration, we probably have three times as many. I do believe that the state must take measures so that fired employees receive 70 percent of their salary for the first three years while receiving training so that they can be redirected to sectors with higher demand. 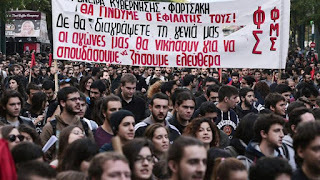 Regrettably, radio and television pundits have made Greek society touchy about any measure that infringes on the sacred cow that is the civil service. However, sacrificing part of it is the only way to achieve a budgetary surplus without further harming the economy. Over the past five years, Greek governments’ economic policy has mostly been about imposing taxes and more taxes while reducing pensions and salaries. The economy has slowed by 25 percent and 1 million people have lost their jobs. The proposals of the SYRIZA-led coalition seem to be restricted to raising taxes by a significant degree. Such measures will only bring about the same results: deeper recession and higher unemployment. Firing a civil servant presupposes a ministerial decision that abolishes the position held by the employee. Greek ministers seem to be unable to make such a decision. At the same time, they have no qualms about green-lighting brutal taxes so they can assure voters that “state sector salaries are guaranteed.” However, taxes have a detrimental effect on economic activity and lead to more sackings in the private sector. A minister would find it far easier to introduce a tax measure that would result in 100 private sector dismissals than one which would lead to the layoff of one civil servant. Greek society is – also because of media influence – passively watching ministers behaving in an unfair and unacceptable manner. Greece spends more money on pensions as a percentage of GDP than any other country. Given the sorry state of the economy, there is a need to examine what measures can be taken to cut spending. As is usually the case in this country, the corruption is hidden in endless technicalities, an overdose of legislation, and a lack of evidence and transparency. Three observations here: Firstly, it is unfair to cut the pensions of 80-year-olds to protect the premature pensions of their 50-year-old counterparts. We need a law stipulating that no early pension be awarded to under-65s. Early pensioners should not be entitled to a basic state pension. We also need to scrap any provisions that favor early retirement. Secondly, we must do away with the dozens of third-party levies that unevenly boost the pensions of various privileged groups (such as journalists and lawyers). Finally, all auxiliary funds must be integrated with the mainstream funds. This would help simplify the system and enhance transparency. Greece needs to boost production and exports. It needs investments. Any measure that can facilitate production and exports would be welcome. Anything that obstructs them would not. This rule must run through the agreement with creditors, if Greece is to hope for an economic upswing. That would not be easy, of course, for it presupposes ditching the statism which has been used by all governments (no one has used it more than SYRIZA) as a tool to hold on to power. Statism breeds a large number of state-dependent parasites that deprive healthy, non-state-dependent forces of funds. It is within this context that we must look at labor reform, not within the government’s “red lines.” It is in that context that we must examine privatizations and big, self-financed investments. Not just the ones that have already started, but dozens of others that have yet to start, such as the concession of the port at Lavrio, east of Athens, and its connection with the Attiki Odos highway and the suburban railway, as well as the concession of the island of Makronisos for the installation of wind turbines and solar panels. And, finally, it is in that context that we must examine the complete abolition of the emergency property tax known as ENFIA and the economic independence of municipalities. Municipalities must be financed by the residents who benefit from their services. It is the residents of a municipality who must pay, not all taxpayers with the state acting as mediator. I am not optimistic. I believe that the problems will remain unsolved unless we (a) commit to achieve increasing budget surpluses, (b) drastically reduce the size of the civil service and (c) cut back on statism. Any agreement that does not include the above elements will only postpone the next crisis, which will not be far down the road. Below, Greek finance minister Yanis Varoufakis who recently stated Greece's creditors have turned negotiations into a war, was the keynote speaker in Germany at the Hans-Böckler-Stiftung (his speech and responses are in English and the speech is available here). Varoufakis highlights why Greek pensions are in such a dismal state but he fails to mention the single biggest problem with Greek pensions, namely, the total lack of proper governance which introduces real transparency and accountability. Instead, the people running these pensions are political appointees or union hacks who are completely and utterly clueless on proper pension governance. Also, Varoufakis speaks eloquently on "European solidarity" and has urged Europe's leaders for a speech of hope for Greece as well as a new deal for the country. Unfortunately, Greece will never get the new deal it truly deserves under a Syriza-led government, only more statist policies that have been perpetrated by all Greek governments since Andreas Papandreou was first elected in a landslide victory over thirty years ago. This is the true Greek tragedy and economic suicide that successive Greek leaders have fed over the years to quench their insatiable thirst for power, one that has slowly but surely suffocated the country, forcing younger Greeks to leave in search of better opportunities elsewhere (if they are lucky). Keep all this in mind over the weekend as we're bombarded with articles warning us that Greece is flirting with catastrophe. It's not just Greece flirting with catastrophe, it's the entire eurozone and the world as our political leaders seem incapable to address structural issues that are plaguing the global economy, robbing future generations of a productive and peaceful life.